What is the aim of an arm lift? An arm lift is a aesthetic surgery procedure on the inside of the arms to tighten the skin by resection and lifting, and to remove excess fat using lipoaspiration. 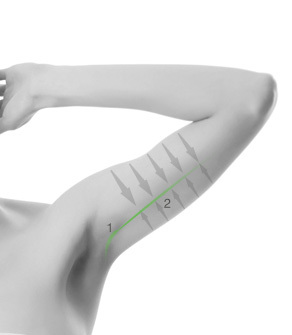 What are the principles of aesthetic surgery on the arms? Where there is sagging of the skin on the arms ("bingo wings") (as we often find in women over fifty or after weight loss), arm surgery involves a lift to tighten the skin. An arm lift may or may not, therefore, be combined with lipoaspiration (liposuction) to reduce excess fat. There are two techniques for arm lifts (brachial lifting). Indications: this type of arm lift is performed when there is a large amount of excess skin, usually after major weight loss. Indications: this type of arm lift is performed when there is a minor amount of excess skin, usually in women over fifty. Lipoaspiration (liposuction) of the arms is performed to reduce excess fat. The arm lift itself is then performed to tighten the skin on the inside of the arm. The arm lift scar is situated inside the armpit. If the surgeon thinks that state health insurance may cover the surgery (in accordance with the social security criteria), a prior approval request will be written. You will be invited for a meeting within 15 days of receipt of the letter. The state health insurance medical advisor will make the decision and will send a written response to your plastic surgeon. If the request is successful, the surgery will be deemed reconstructive surgery. If not, it will be considered as aesthetic surgery.